Driving into 2018 in Style! Over the last several years, our utility feed cart has broke down too many times to even count, requiring constant maintenance and repair. After years of daily use, parts started falling off, other major mechanical parts were malfunctioning, the battery kept dying if temperatures dropped below 20 degrees and it required more frequent oil changes and spark plug replacements than expected—just to name a few of its issues! 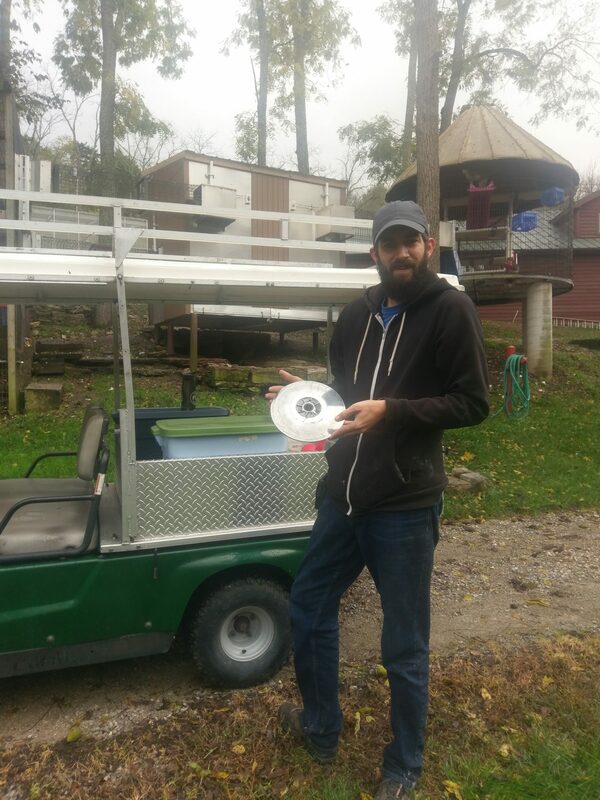 Scott, the maintenance and grounds keeper for the sanctuary, discovered that this piece just fell off the cart one afternoon while it was trying to drive up the hill on Monkey Road. 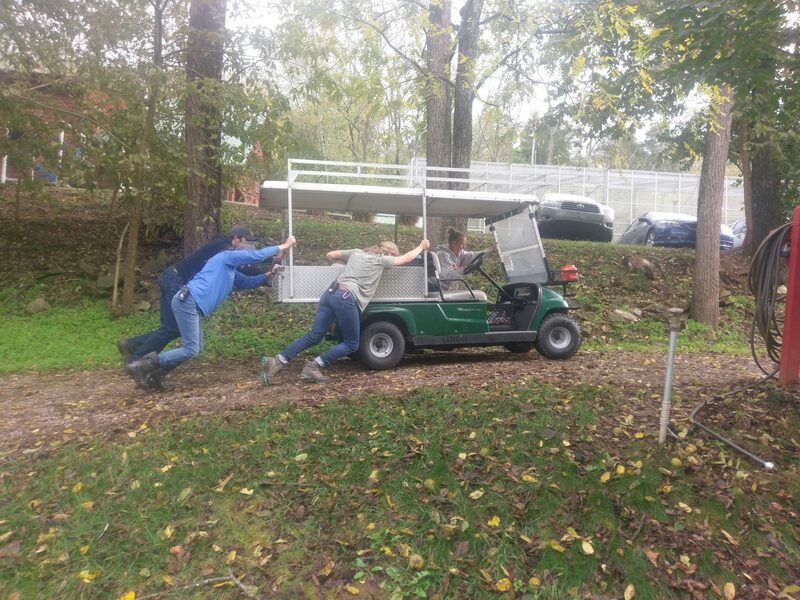 Staff members pushed the utility cart up to the workshop—this had become such a frequent occurrence that the staff knew exactly what to do when the call came over the radio. We tried our best to keep repairing our beloved cart, but the staff really needed something that they could rely on and something that didn’t constantly require our attention and resources. The gas-powered feed cart eventually had driven its last day. 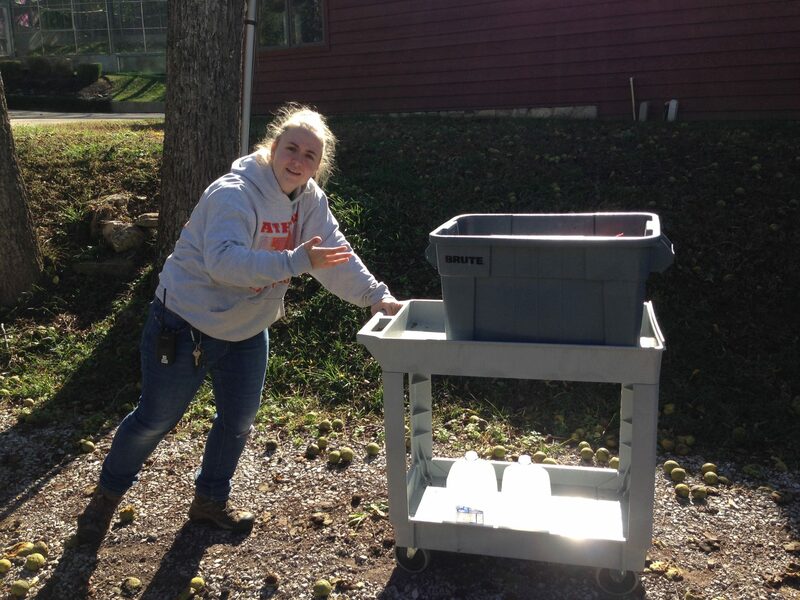 The utility feed cart is an essential tool for the sanctuary. We use it every day to help implement all of our animal care programs, such as our nutrition, enrichment and medical programs. We knew we would need to replace the old one in order to continue providing the apes and monkeys with the best of care. Fortunately, the Kentucky Colonels extended a helping hand. The Honorable Order of Kentucky Colonels is a wonderful, philanthropic organization that awarded our sanctuary with a $5,200 grant. This was exactly half the amount that we needed to purchase a new feed cart. With this huge head start, we were prepared to raise the other half of the funds! We reached out to our supporters on social media and through our newsletter asking for donations in order to purchase a new utility cart. In the meantime, we used a rolling plastic cart (on a gravel road) to transport food and supplies around the sanctuary. Animal caregivers used the rolling cart to deliver breakfast to all of the monkeys across the property—avoiding fallen walnuts and other hazards along the way. 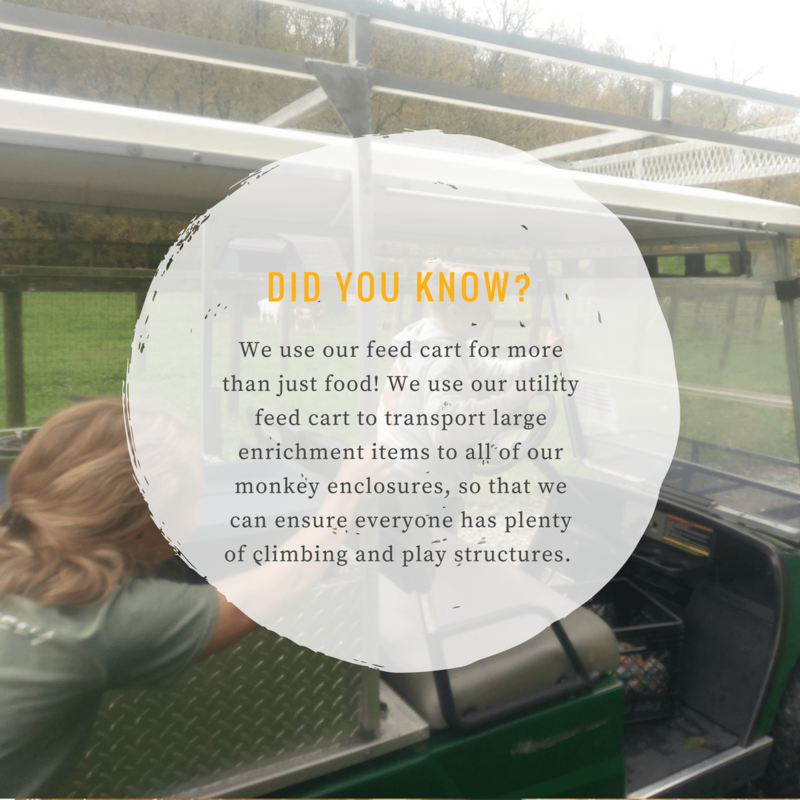 While the feed cart was out of commission, we struggled to get food, enrichment, medicine and other vital materials to all of the residents in an efficient manner. Fortunately, we weren’t struggling long thanks to our dedicated and passionate supporters. The love and generosity we received from donors was overwhelming. We raised the second $5,200 in no time with their help. 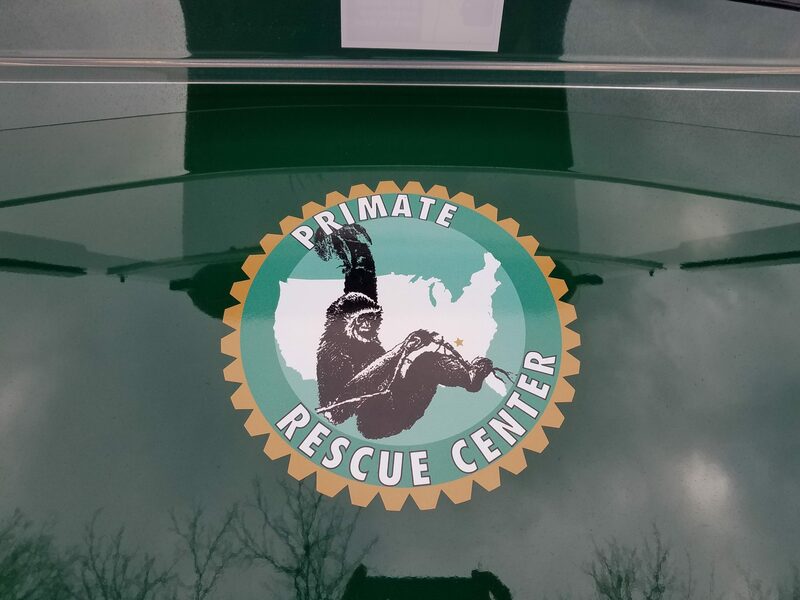 We are so honored and humbled by everyone who donated, and we appreciate their love and generosity for the primates! We reached out to Alan Houp with Dever Golf Cart Sales and Rentals hoping that he would have a cart that would fit our needs. 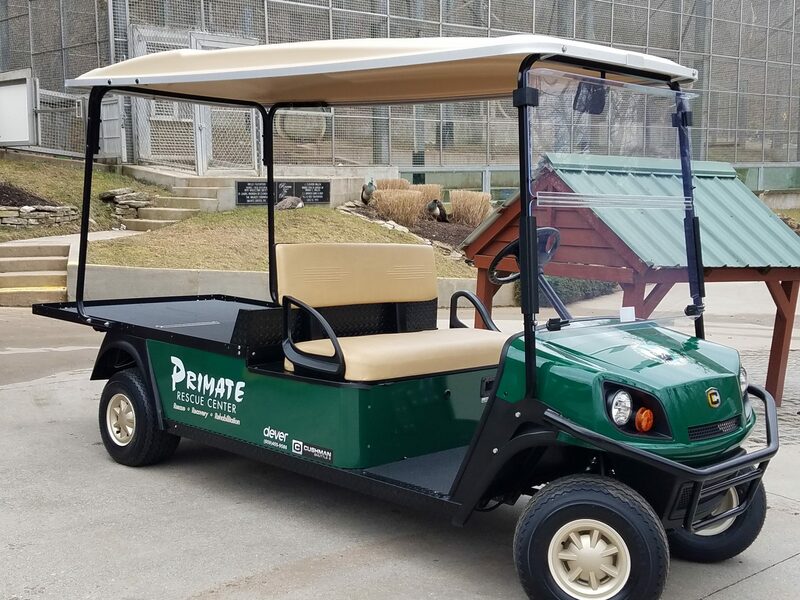 We wanted to purchase an electric cart that would be sustainable, environmentally friendly, require low maintenance and last years into the future. 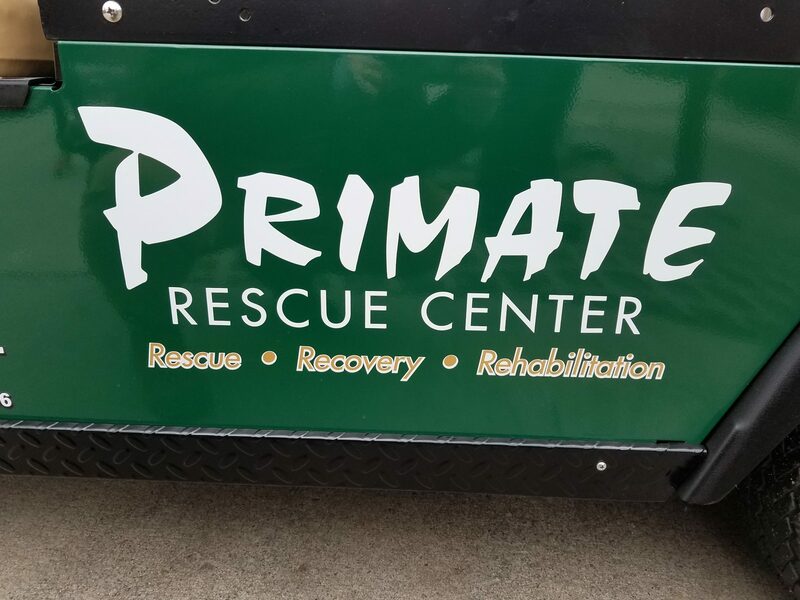 We knew that spending less money on repairs and upkeep would allow us to rescue and rehabilitate more deserving primates. Alan recommended the perfect model, and even offered to add our logos on the side and install accessory features at no extra cost to us! This January, we laid eyes on the brand new utility cart for the first time! What an exciting day. Lucas, a Dever employee, delivered the cart to the sanctuary and even gave us a tutorial on how to properly drive and maintain the vehicle so that it will last us a very long time. 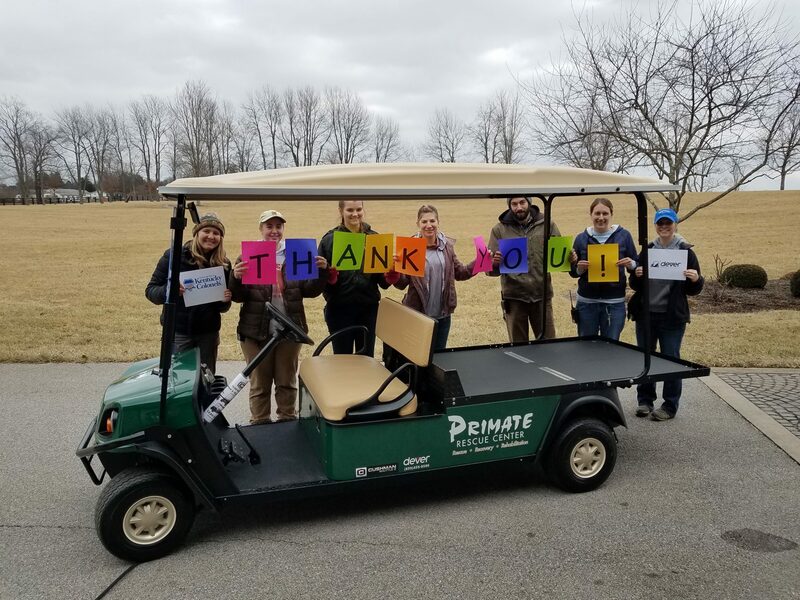 We couldn’t be any more grateful to The Honorable Order of Kentucky Colonels, the folks at Dever Golf Cart Sales and Rentals, and our supporters who helped us acquire this necessary vehicle for the sanctuary. Each day, as we are delivering food, medications, enrichment and materials to the monkeys and apes, we will remember your kindness and cherish your support!